I’ve been thankful to observe -and even taste- several plants before deciding to include in my food forest. One of these I was thankful to try because I will not be including, Cornus kousa. My neighbor has two in her yard. She of course has them for the flowers, which in spring are gorgeous. Kousa dogwood has a resistance to some of the diseases making our native dogwood, Cornus florida, scarce. What I’m interested in are the copious fruits produced September through October in considerable shade. 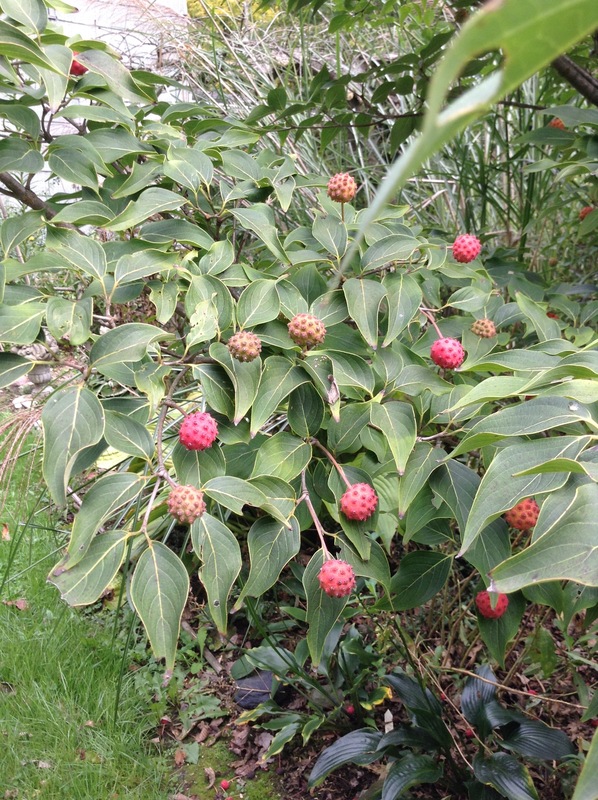 Cornus ‘Kousa’ fruits. This is the tree that gets more sun. For instance, the one that’s about 15 years old, ten foot tall, gets maybe two hours of direct sunlight a day. 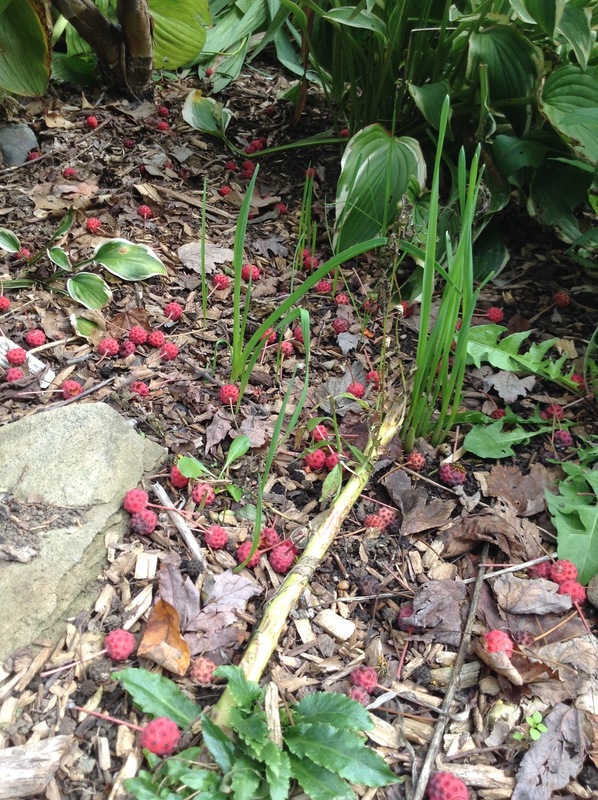 The only thing that will grow near it in the same shade is violets and some inactive hostas, but it still produces loads of blunted-spike covered red balls in fall. These trees make a lot of fruit. The Allium looking shoots are garlic (Allium sativa) that she has let perennialize under the tree among other plants. The consistency of the fruit has been described similar to paw paw, which I’d differ from, saying it’s much more gritty. Some people are fans of the flavor too, but for the last three years I’ve tried the fruits ripe enough to fall off the tree, still on the tree, from the one in shade, the one in more sun; I’ve experimented. But they taste awful. Something about the texture of the skin as you’re licking out the gooey inside is pleasant, but the flavor is exceedingly bitter with an intense turpentine taste. I really wanted to include this in my food forest smack behind the big Catalpa because I see how much shade it can take and fruit so profusely. It would only be for flowers. I did try one yesterday that was just at the point it wasn’t squishy or rotten, and it did have a slightly rich, fruity tang; but then the turpentine taste twitched in the background and I didn’t go on. Still not worth it. I can’t be so small minded as to say soil and climate conditions varying couldn’t make for a better flavor. My neighbor’s soil is quite sandy, and higher in phosphorus judging by the way her grass easily pulls up, so this might not be a good situation for flavor. If you’re interested in including this tree in your food forest, do taste a fruit before making up your mind. It doesn’t jive with everyone. Now watch, I’m going to get a bunch of comments from people who love it.